Pottery, metalwork, sculpture, costumes and textiles, and architectural elements dating from the Neolithic period through the present from China, Japan, Korea, India, and Southeast Asia. 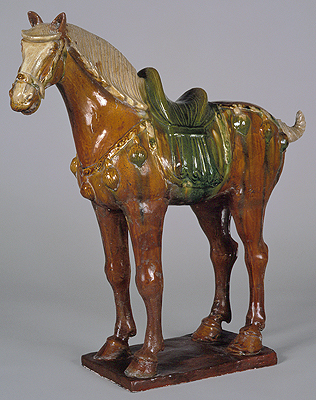 As early as the Han dynasty (207 BCE-220 CE), representations of Central Asian horses made in pottery and bronze were considered essential in the tomb furnishings of high officials. In the Tang dynasty, numerous pottery horses of exceptional sculptural quality were consigned to tombs of the wealthy, attesting to the continuing importance attached to the fine breeds imported from Central Asia specifically, the kingdom of Ferghana. The more natural modeling and the posture of the horses reflect a general change from preceding dynastic traditions. Equestrian portraiture was in great demand during this period, both in sculpture and in painting, but it is likely that the sculptor took the initiative in establishing the new ideal. The lotus bearer, Padmapani, is one of the early bodhisattvas, or male saints, in the Buddhist pantheon. Bodhisattvas were an integral part of the Mahayana, or great vehicle, sect of Buddhism. They were individuals who on the moment of attaining enlightenment, selflessly turned back to guide others toward that goal. Unlike the Buddha, who is always unadorned, bodhisattvas, who had not reached full enlightenment, are usually depicted with rich jewels, fine robes, and elaborate hairstyles. 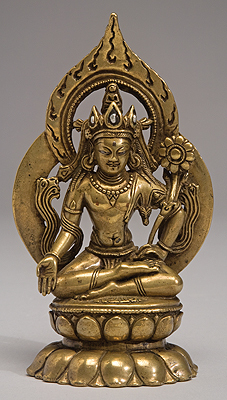 The left hand of this figure holds a lotus, the symbol of purity, which is his identifying characteristic. The right hand extends downward in a position signifying the bestowing of gifts or boons to the worshipper. He is seated in a meditative position on a double lotus pedestal that echoes the lotus held in his hand. Bronzez from Kashmir, unlike those found in Nepal and Tibet, are not usually gilded or painted. The legendary koma-inu, or Korean lion dog, guarded the entrance to Japanese shrines and temples. They appear to owe their origin to the Chinese lion dog, or shishi, which was popularized by the Buddhists and also served the purpose of temple guardian. They are usually paired, with the male depicted open-mouthed, an expression of the first Sanskrit vowel, aum, while the female is close-mouthed, an expression of the last vowel, um. As a pair, they represent the beginning and ending of Buddhist teachings. The female is usually depicted with a pup, symbolizing fertility, while the male either carries or has one paw on a ball that symbolizes the jewel of wisdom, the Buddhist concept of emptiness, the state of mind that precedes the ultimate attainment of wisdom. The inscription indicates the name of the deity, which appears to be a hybrid Shinto deity in a Buddhist guise, as well as the village, which is carved into the bodies of both animals.